Thinking About Ways to Get Students Involved - Fun In the Classroom! 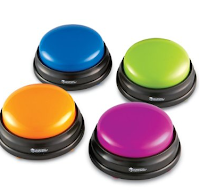 The first one is a set of Learning Resource Buzzers. Each of these buzzers makes a different sound (honk, doorbell, boxing bell, and boing!). I also bought a set of similar buzzers that make animal noises. Cool! I already have my class get into groups quite a bit, so this will be a fun way to have challenging competitions. And, best of all, I won't have to be the judge of who answered first - I am hoping it will be easy to tell since each group will have a different sound. 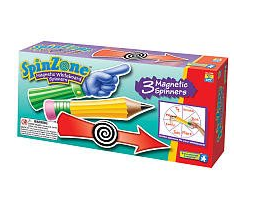 I also purchased a set of Magnetic Whiteboard Spinners. I thought I would let everyone know how my first experience went with using QR Codes in the classroom. 1) Would the technology actually work? 2) Would students be prepared for class - would they have downloaded an appropriate app? 3) Would students use the app as intended, or would they just write down all the answers? I tried this activity with my Geometry Honors class. I have three classes of Geometry Honors. These three classes are actually very different. One is made of almost all freshmen, one is made of almost all sophomores, and one is a mixture. I am happy to report that the students in all three classes were prepared for class. Although not everyone has a smart phone, we had enough students with smart phones and an appropriate app that we could make plenty of small groups. The technology worked fine! I was worried that perhaps our wireless wouldn't be able to handle that many requests at once, but it was fine. In fact, I guess I shouldn't have worried about it because in the activity I used, students didn't have to connect to wireless at all. The QR Codes I used led to text, so it wasn't a problem. After I had so much success with this activity the first day, I tried using QR Codes again the next day...I simply made a QR Code out of the answers to my students' homework. I had one student from each group come up and scan the code and then go over the answers with their group. I am so looking forward to finding more uses for QR Codes in the math classroom. In celebration of my new blog (designed by A Bird In The Hand Designs) I am hosting another Success In Secondary Linky Party. Feel free to link up your favorite middle or high school activity. Thank you for all your support this year! Look for continued Linky Parties Monthly this summer! Whenever I start to feel sad about it, I will remember my juniors - they'll keep me smiling! Do you have your own favorite end of the year math lesson? New Sale Starts May 7th! 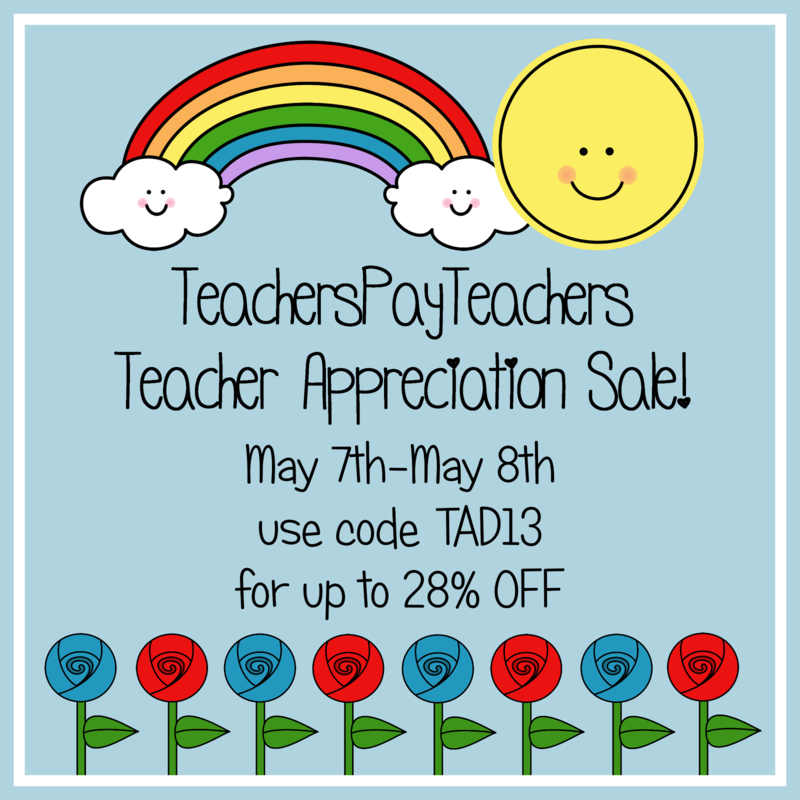 You can get 20% off of my store - then if you use the code TAD13, you can get an additional percentage off. Participating in A Super Secondary Giveaway! I am participating in a Super Secondary Giveaway! More than 40 Secondary Teachers are Participating. Hop on over to http://studyallknight.blogspot.com or http://thesuperheroteacher.blogspot.com/ to enter.